Maccabee Aish is committed to encourage fire safety and fire prevention, and to provide educational programs for the Jewish community to help reduce personal injury, property damage, and loss of life resulting from increased fire exposure due to frequent participation in rituals that involve fire. Each year Jewish communities are devastated by loss of life and property due to fire. Many Jewish observances such as Sabbath candles, the Hanukah Menorah lighting, and burning of chometz (leavened bread) before Passover include the use of fire. It is clear that holiday and Sabbath observant homes are at high risk for fire and burns. While 60%-70% of Jews report participating in some type of personal religious observance, those who participate in observances regularly are exposed to an elevated risk. Traditional fire safety and prevention programs suggest avoiding leaving candles and cooking appliances unattended and extinguishing candles and turning off stoves prior to going to sleep. These suggested interventions are not always an option for this special population due to religious proscriptions. Maccabee Aish was founded to reduce the fire and burn risk that the Jewish community faces by addressing the unique fire safety and prevention needs of this special population. As a Paramedic with a volunteer fire department, an active Hatzalah member, a physician assistant specializing in emergency medicine, and a Doctor of Health Sciences, I am painfully aware that some of the most horrific emergencies involve burns and fire related injuries. Many but not all fires are preventable. Accidental fires are a fact of life. When fires do happen, injury and loss of life are not inevitable. Sadly, victims often become trapped simply because of a lack of fire plan or escape route. Unfortunately, it has become all too common to hear of fire related tragedies within the Jewish community. 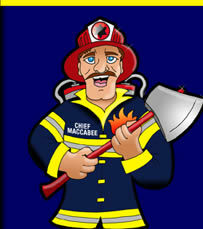 Maccabee Aish was founded to promote fire safety and prevention to this population. I encourage you to participate in our programs. You will learn how to protect your family from increased fire risk and assure your family’s safety through the installation of smoke detectors and fire extinguishers in your home; the purchase of a fire escape ladder for every occupied upper floor room; and the development and practice of a fire escape plan for your family. Through spreading our message to community organizations, schools, and synagogues; may we merit to never again hear of a fire related tragedy. Founder/ President Maccabee Aish, Inc.
Builder/ Developer Samlor Construction, Inc.